So traditionally, a martial art is a military art. The first things that usually come to mind when discussing modern martial arts are leaping, kicking, punching, blocking, inverting elbows, twisting necks, throwing, and weapon fighting. But also horsemanship, javelin throwing, archery, spear fighting, halberd fighting, wrestling, knife fighting, rifle, shotgun and pistol shooting, demolitions, logistics, and battle strategy can all be described as the field of martial arts. Anything that a soldier might do in battle is a martial art. By martial art usually it is meant aikido, arnis, boxing, capoeria, chow gar, choy la fut, hapkido, hsing’i, hun gar, jeet kune do, jow gar, judo, jujitsu, karate, kempo, kick boxing, krav maga, kung fu, pa kua, penjak silat, praying mantis, savate, shaolin, tae kwon do, tai chi, white crane, wing chun, wu shu and more! As you can see the list is quite long and it is actually quite amazing how many martial arts systems there are and how many methods of self defense can be formulated. Often within a martial arts school it is taught that ‘this particular system is the best system and it was created to beat all the others’. Of course every martial artist would have the viewpoint their style is the best because that is the style they have chosen to do, but in reality what they are saying is ‘this is the best style for me as it suits my temperment and I like the teaching environment’. Throughout this history and development of the martial arts and all the combat systems of man our training tools have played a vital part in evolving and perfecting these systems and techniques. All the martial arts have been effected by the role that mechanical devices play whether it be weapons, dojo mats, breaking boards or even the uniforms we wear – all these paraphanialia indentify the martial arts into their systems and style. The main players in shaping our new martial arts would be the traditional wooden dummy, wing chun rings, iron palm ointments and even the system of using forms and karta have developed the martial arts into their current form. Even today modern training tools are common and again the martial arts are under development with new training products such as the Wavemaster, the BOB training dummy, the Focus Master. All with one thing in common, to create a well rounded combat system. Ideally a martial arts solo training tool should be workable for all and based on sound theory and through constant practice develop into sound physical application. The ideology and theory would have to take into account all the history of the combat technology of man and give this competition and street application. In a martial arts career you can occasionally find your self with no school to go to or no one to train with and so out of necessity the martialarm solo training partner was born. The Martialarm is a Martial Arts training machine used to develop the entry and trapping skills of any martial arts system. It is designed to actually test any techniques so to improve the ability to trap and control your opponents hands and arms. This can be done because the Martialarm moves and reacts like a real opponent. The Martialarm moves and twists up, down, left and right just like a real opponent would – so it can spring forward and it does strike back!. #3) Adaptability – Techniques, attacks and defenses must flow but not necessarily at a constant pace. Adaptability to choose what’s next is key! Whatever martial arts you choose just be sure you do look at a few before you decide and enqire with the school what martial arts equipment they utilize to get the best from your training. Martialarm Martial Arts Kung Fu is a total control system incorporating scientific body weapons with unconditional workability in both attacks and defense. Formula Fighting allows a pre-emptive attack and defense – a much faster system of fighting than the conventional ‘reaction response’ defenses. Formula fighting correctly applied transcends current martial arts technology to evolve into a martial science so to set new standards. Chinese combat methods especially are renowned for the wide variety of their hand techniques. Most Kung-Fu styles use a wider range of hand/arm weapons (such as claws, gouges, palms, backhands, punches, backfists, hammerfists, forearm, elbows and shoulder strikes) than their Japanese, Okinawan and Korean counter­parts. 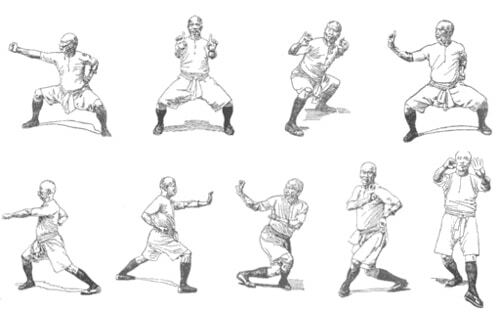 In addition to the actual number of natural body weapons used there is also a tremendous range of different applic­ations due to the regionalised develop­ment of Kung Fu styles and the different approaches taken by hard or internal/external styles. In this analogy, the legs are used as the body’s heavy artillery, while the hands are the body’s infantry. In a military en­counter, it is common to use first satelite technology to view the opponents attack and defense cababilities and then use long distance stealth artillery to soften up the enemy and to provide a moving cover behind which the infantry can advance to seize and hold disputed territory. Without the benefit of the artill­ery, the infantry would take heavy casual­ties. However, artillery on its own cannot seize and hold territory – a major bom­bardment may drive the enemy out. So it is with arm and leg techniques – we often use our legs to soften up the opponent and to enable us to bridge the gap until we can close in and finish the fight with hand/arm techniques and the proper use and co-ordination of hand/arm and leg techniques is often crucial to success/ survival. We espouse a combina­tion approach which uses hand/leg attacks from different angles of attack and at various target levels. The concept is to keep a flow of offensive techniques moving into an opponent’s target zones from different angles and at different levels, in order to disorientate him/her completely. We believe that this approach is superior tac­tically to reliance upon one or two heavily committed techniques. b. Create an inertia breaker, a movement that will help you overcome the inertia (resistence to motion due to gravity and friction). b. All body parts eg arms and legs, in any move be it a punch, block or kick, must always end up in a bent elbow or knee movement to enable a very quick change in any direction at any time. NOTE: ‘End’ of action should not be taken literally as one should never really stop action until the job is done. Our ‘end action’ should be programmed to an interuppted continuity as if this stage is still the middle stage. Most Chinese styles use a relaxed approach to power development. We try to keep unnecessary muscles from being involved in the technique, in order to avoid inhibiting the prime movers behind a certain technique from doing their job. Essentially, a straight punch is a triceps-driven technique and the Chinese style of punching allows the triceps to do its job without the inhibition of significant biceps involvement in this punch. Most other techniques can be viewed in a similar fashion – you have muscles which are vital to the effective execution of a technique and muscles which are not, or which are even counter-productive when involved in that technique. No matter which martial arts style you do, try to avoid unnecessary muscle involvement. Many Chinese styles use more “follow-through” in their techniques and achieve their power by driving the entire body weight through a target zone at speed. The arm is totally relaxed until contact is made and the body is still driv­ing deeper into the target when focus is brought to the technique using a trigger. The body has more inertia to overcome before it can move with the descending line of force and, as a result, the power is more completely absorbed by the body­rather than being partially dissipated by the body moving more freely with the punch, as with a horizontal line of force. • Palm Strikes. (Tile Shattering, Yin/Yang, Wil­low Leaf and Hurricane Palm). • Finger Strikes. (Flying Fingers, Immortal Pointing the Way, Twin Dragons, Tiger Claw, Eagle Claw, Dragon Claw, Rat Claw and Crab Claw). • Back Fist Strike. (These tend to be follow­through rather than the ‘snap’ versions). • Bottom Fist Strike. (Iron Hammer equates to the Japanese tettsui technique). • Forearm Strikes. (This is used for smashing, sweeping blows of great power). • Elbow Strikes. (This is generally used in a very flexible manner using multiple strikes). • Shoulder Strikes. (Used for close-in work, of­ten to propel an opponent out into punch­ing range). As you can see, there is an emphasis on tightly targetted use of a specialised hand formation in many cases. It is not enough merely to lash out in the hopes of an effective strike. In a ring situation, the “when in doubt, lash out” tactic may gain you points, but in the street it will be ineffective, unless you are lucky enough to impact on a vital point. A precise, surgi­cal strike or kick into one of your opponent’s vital or weak targets is needed and your combinations should be struc­tured with this in mind. 1. Revolutionised Martial Arts thinking and design of “Formula Fighting” or “Martial Arts by Numbers” that allows pre-emptive attack – a much faster system than the conventional “Reactionary Response” to attack. 2. Development and pioneered Martial Science – a system which enables practitioner of all styles to evaluate and modify current technologies to improve efficiency and allow comparisons with proof of technologies, concepts and technologies. Certainty in containing the opponent by a huge technological edge and a super tough body and mind. 1. Capabilities – Current martial arts technologies have been transcended by total control in that it is a martial science based on failproof concepts. 2. Control – Allows total control of the opponents capabilities making him defensively impotent. Multi functional applications in everyday life as well as in self defense. 3. Confidence – The small, the unco-ordinated, the disabled and also the best and brightest will gain in self belief through this training. Attack systems that cant be blocked. A shield that cant be breached. Body toughening, Formula fighting, Stealth and U.F.O weapons including the Nukes. Mind freeze technology that shuts the opponent down. 3Cs Capabilities and Control bring about Confidence. 1. Traditional Martial Arts – Animal styles or based on kata and ritualised. 2. Acclectic Martial Arts – Collection of what works for the individual into a new style. 3. Designer Martial Arts – Only the usable of conscious mind, scientific and repeatable. In a martial arts career you can occationally find your self with no school to go to or no one to train with and so out of neccessity the martialarm solo training partner was born. The Martialarm is a Martial Arts training machine used to develop the entry and trapping skills of any martial arts system. It is designed to actually test any techniques so to improve the ability to trap and control your opponents hands and arms. This can be done because the Martialarm moves and reacts like a real opponent. The Martialarm moves and twists up, down, left and right just like a real opponent would – so it can spring forward and it does strike back!.